Men dressed as Secret Service agents stand guard next to Tom One and Tom Two, this year's turkey and alternate. The annual presidential turkey pardoning event at the White House, which took place again today, is a peculiar one. Presiding over his sixth one last year, even President Obama seemed confused by it all. "It is a little puzzling that I do this every year," Obama said, "but I will say that I enjoy it, because with all the tough stuff that swirls around in this office, it&apos;s nice once in a while to just say, &apos;Happy Thanksgiving.&apos; "
"Time flies — even if turkeys don&apos;t," Obama said Wednesday before looking off to his right for his daughter Sasha&apos;s approval. There&apos;s always lots of laughter for a lighthearted moment the day before Thanksgiving, but the truth behind the turkey pardons is a strange and sad tale with a long and myth-filled history. 1. Where did they find these turkeys? 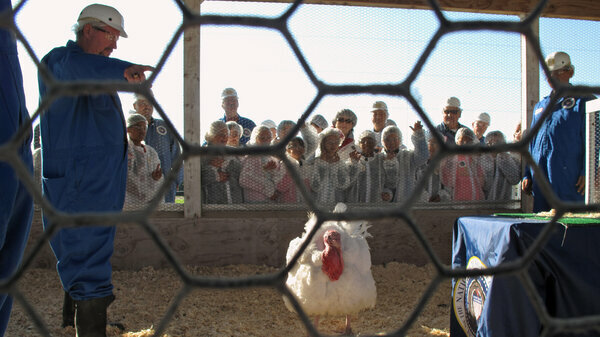 This year&apos;s birds are from an industrial turkey farm in Modesto, Calif., Foster Farms. This year&apos;s chosen ones are named Tom One and Tom Two. Not very creative, but they were given new ceremonial names — Honest and Abe — voted on in a Twitter poll promoted by the White House. The names were submitted from hundreds of kids from California. Just Tom One--Abe, in this case--stood in front of the president. Tom Two was selected as an alternate. Don&apos;t worry, both of their lives were spared — temporarily, anyway. The Toms were chosen out of a flock of 50, which were whittled down to a dozen finalists and picked in front of a class of fifth-graders. Foster Farms manager Joe Hedden said Tom One was a clear winner because of his personality. He apparently really likes to strut his stuff (he gobbled quite a bit at the crowd gathered at the White House), Hedden said before parting ways with the turkeys, who boarded a first-class flight to Washington called, not kidding, Turkey One. "We want to present the president with a well-mannered and socially skilled turkey that&apos;s going to act right on the big day," Hedden said. 2. Do they always get the turkeys from the same place? No. 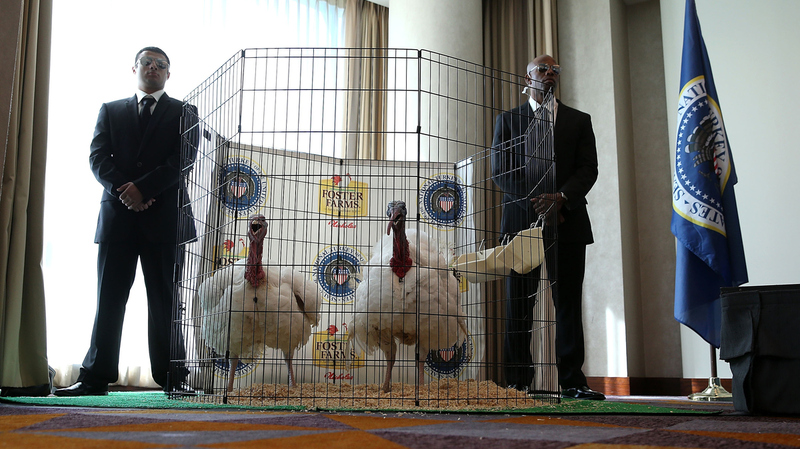 Here&apos;s the thing: This is an event run by the National Turkey Federation. Yes, even turkeys have lobbyists. (They have offices four blocks from the White House.) The group is so involved in the event that it even paid for the turkeys to take a presidential-style motorcade from the farm to the airport flanked by fake Secret Service agents. The men in dark suits with earpieces are all part of the show, as are faux presidential decals depicting a turkey wearing a pilgrim hat at the center of the "Seal of the National Turkey of the United States." The chairman of the federation usually picks a turkey from his home state, and this year the chairman is Jihad Douglas, president of Aviagen Turkeys, a "supplier of turkey breeding stock." 3. When and why did this begin? "The Library&apos;s staff has found no documents, speeches, newspaper clippings, photographs, or other contemporary records in our holdings which refer to Truman pardoning a turkey that he received as a gift in 1947, or at any other time during his Presidency. ... Truman sometimes indicated to reporters that the turkeys he received were destined for the family dinner table." So, Truman was the first to receive a ceremonial turkey from the National Turkey Federation (and the Poultry and Egg National Board), but he ate it (as did Eisenhower). And that was the intention of the gift — to raise the profile of the bird and maintain its institutionalization as a Thanksgiving and Christmas staple. 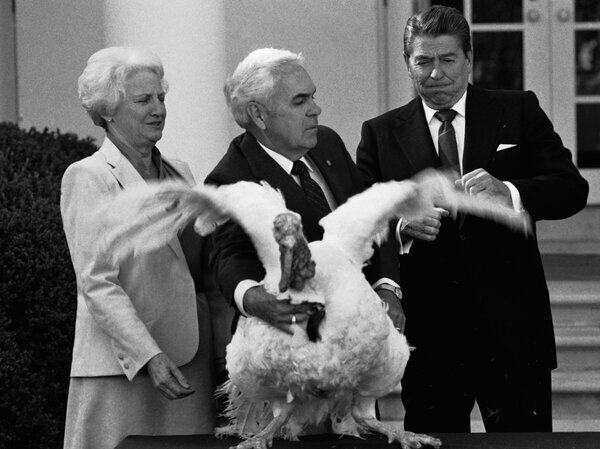 The tradition of giving turkeys to the president goes much further back, though, than industry groups&apos; involvement. From 1873 to 1913, a turkey dealer from Rhode Island named Horace Vose, known as the "Poultry King," became the unofficial turkey provider to the White House for Thanksgiving and Christmas, according to the White House Historical Society. In 1913, Vose got some competition from a former Kentucky congressman, who claimed his bird tasted better because it was fed a diet of red peppers. After Vose died in 1913, it was something of a free for all. 4. OK, so if it wasn&apos;t Truman, then who was the first to pardon a turkey? It depends on your definition of "pardon." An 1865 dispatch from White House reporter Noah Brooks is the oldest-known account of a presidential turkey clemency. It was about Abraham Lincoln sparing a turkey two years earlier. It was a Christmas turkey that his son Tad had taken a liking to. John F. Kennedy appears to have been the first to let a Thanksgiving turkey go. "We&apos;ll just let this one grow," he said. The LA Times headlined that 1963 event — in which a sign hung around the turkey&apos;s neck that read, "Good eating, Mr. President" — as a "presidential pardon." Richard Nixon also chose not to eat that particular bird and sent it to a petting zoo instead. Ronald Reagan in 1987 was technically the first president to use the word "pardon" about a turkey, but it was really just a way to deflect questions about the Iran-Contra scandal and whether he would pardon key players involved — Oliver North and John Poindexter. The bird, "Charlie," was already headed for a petting zoo, but after Sam Donaldson of ABC News pressed Reagan on whether he&apos;d pardon North and Poindexter, Reagan responded, "If they&apos;d given me a different answer on Charlie and his future, I would have pardoned him." Two years later, George H.W. Bush formalized the turkey pardoning ceremony, giving birth to the modern-day tradition. 5. What happens to the turkey afterward? This is where the story turns very sad. They are sent to a farm in Virginia, where a former governor raised his own turkeys, but they do not live very long. 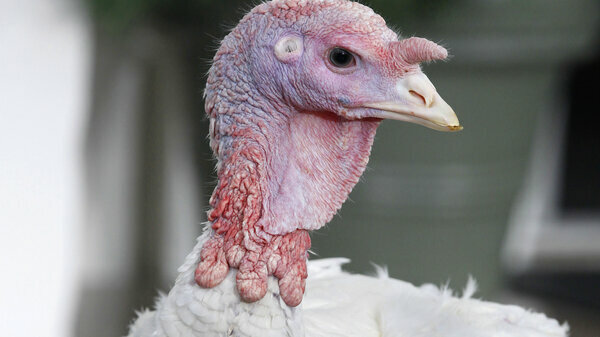 In fact, every pardoned turkey is dead except for two — "Cheese," the second half of last year&apos;s duo ("Mac" died in July of this year), and "Courage," pardoned in 2009. These birds, though, are bred to be eaten. Many industrially grown turkeys are fattened up with a protein-rich diet of corn and soybeans. They can&apos;t fly, because they are too big; their bone structures can&apos;t hold up all that weight for very long; and their organs fail if they&apos;re kept alive too long. These unfortunate facts have been a sore point for animal-rights activists, like People for the Ethical Treatment of Animals, better known as PETA, which listed its complaints, including noting the fates of the recent "pardoned" birds. Others, including writers at the Washington Post and Vox, have called the pardon "America&apos;s dumbest" and "most absurd holiday tradition." But the turkey federation, of course, pushes back on that notion. "Think of the meaning of Thanksgiving," argued Keith Williams, vice president for communications and marketing at the turkey federation. "It&apos;s always been about the presentation of the National Thanksgiving Turkey — symbolic of the blessings of agriculture we have in this country. It becomes a time for the president to recall with the nation our blessings and celebrate the beginning of the holiday season." 6. Why do presidents pardon turkeys? Don&apos;t they eat turkey at Thanksgiving? That irony may account for Obama&apos;s puzzlement. He also joked last year that he was saving those turkeys from a "terrible and delicious fate." People are full of contradictions. It&apos;s clearly been difficult for politicians to say on camera that they would eat the bird presented to them, especially as America has grown away from an agricultural society and grown up with Disney movies heavy on the personification of animals. Americans are far more removed from the actual process of how their food makes its way to their table. "Your grandmother (1940s) would have killed her own and prepared it," Williams notes. "Since the 1950s, it became more convenient for families to have the dressed turkeys (all ready to cook), which they bought from the butcher or their grocery store. Few people actually hunt and dress their own food — we thankfully have the farmers who grow and deliver food to us." 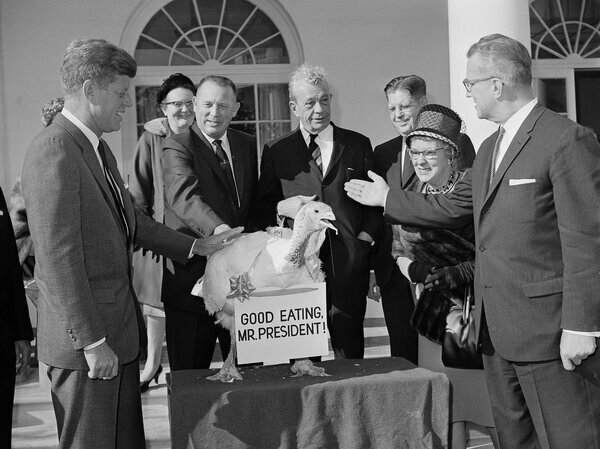 The turkey federation seems potentially open to a return to the days when presidents ate the turkeys presented to them. "The pardoning was a recent custom begun with President George H.W. Bush," Williams pointed out. Some traditions are hard to change. It&apos;s something to think about after you walk through the grocery store, pick out that turkey — and sit down at the Thanksgiving dinner table.